We are now in a position to discuss trading aspects at points in the volume distribution function near the PVP. WARNING!! This is not for new traders. If you have not read and understood threads [thread=1962]I[/thread],[thread=1990]II[/thread],[thread=2008]III[/thread],[thread=2101] IV[/thread],[thread=2130] V[/thread], and[thread=2189] VI[/thread], and practiced with entries, exits and scale-ins using simulation mode until you are comfortable, then entries described in this thread are not for you (click on the thread numbers to see them). This is a dangerous place to be entering a trade. Anything and everything can happen and you can be caught with your pants down. You are probably asking, why is JERRY telling me about this place to trade if it is so dangerous? Two reasons. If you are a basic trader taking entries at the VWAP and 1st SD, you might find yourself caught in this trap and not know what to do. Secondly, if you like excitement and like living on the edge, like the bikers in the first attachment (a picture I found on the internet), and if you have a correct entry, there are lots of bucks you can pull out of the market by trading here. So what's this all about? Well it has to do with price action at and around the PVP. The PVP as you've learned in [thread=1962]part I[/thread], is the dividing line between the low volume zone and the high volume zone. All of the trades we have discussed so far have been in the direction of the skew at the VWAP or its 1st SD in the high volume zone. When price action is around the PVP, it's decision time for the market. The market has to either move back into the high volume zone and continue trading there, or look for new territory in the low volume zone. Thus like the bike riders in the picture, you as a trader will be riding a fine line between the safety of the high volume zone, and the sudden fall into the abyss. How does price action end up at the PVP anyway. There are only two ways: a)the PVP suddenly jumps to where the price action is or b) Price moves there. In either case, if you are in a trade, you are going to want to know what to do. If you are not in a trade, but want and exhilarating experience, here's your chance to do or die. In case a) the skew suddenly flips its sign from positive to negative or vice versa. (Remember the skew is proportional to VWAP - PVP). While skew flips can occur anytime during the day, they usually occur early in the trading day when the volume distribution is beginning to form. Sometimes this is a sign of an imminent reversal. What should you do if you are in a trade and find yourself in this situation? Simple answer: GET OUT!, Dump the trade, win, lose or draw. When price action is near the PVP, price is sandwiched between the VWAP and an SD or betwen 2 SD's. You might notice that price will tend to oscillate back and forth for a while between the VWAP and the SD, across the PVP line or oscillate between the 2 SD's. The market is thinking. Do I want to go back to the safety of the high volume zone where most of the trading has taken place or am I adventurous and want to discover new territory in the abyss of low volume. Don't trade in this region unless you are a scalper. Just wait. Wait for the market to decide what it wants to do, before you decide what you will do. 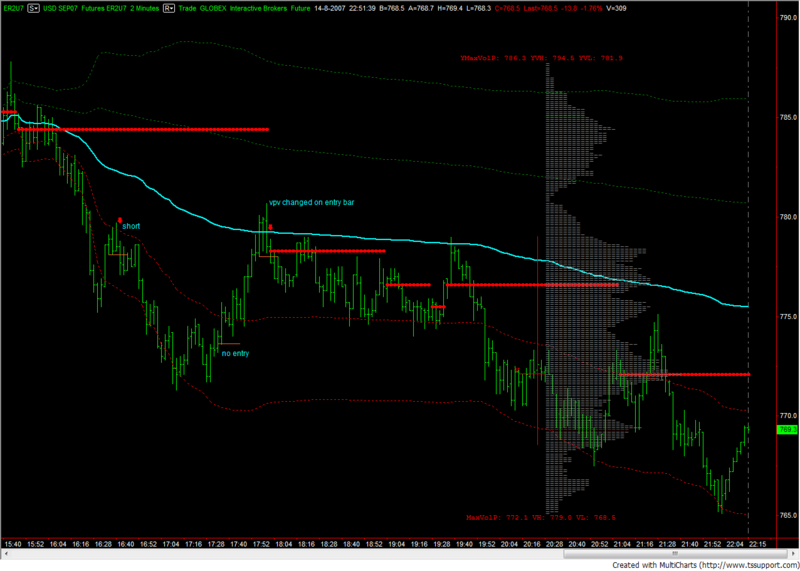 In the first video, we see price action in the PVP area with the VWAP on the downside. The Video shows when to take a trade to the upside on the break out of the 1st SD. In the second video, we again see price action in the PVP area, but this time price breaks through the VWAP. We show how to apply the Shapiro Effect discussed in post 16541 to enter the trade. And finally in the third video, we show a skew flip, where the PVP suddenly jumps to the price action. A trader may have taken a trade just before the flip as shown in the video and exited before the flip occurred, but if he didn't he should exit at the flip price. Regardless of whether price action has moved to the PVP or the PVP has moved to the price action, the effect is the same. You are now looking at a zone where trade entry is precarious, so be cautious. In the next thread [thread=2285]Part VIII[/thread], we will discuss what to do when the skew is close to or equal to zero and the volume distribution function is symmetric. I haven't digested this properly yet Jerry, but just wanted to say hurrah hoping that it will answer some of the questions I raised in the previous thread. seems to me that each contract has its own nuances relative to VWAP. for example, the S&P futures really seem to react as you would expect around the VWAP price -- generally finds support or resistance there -- unless its a strong move -- whereas other contracts (NQ/YM) seem to violate the VWAP without the same regard for it. has this been something you have noticed? I haven't investigated this in any detail Dogpile, but my feeling is that the nature of the instrument your trading shouldn't matter that much. 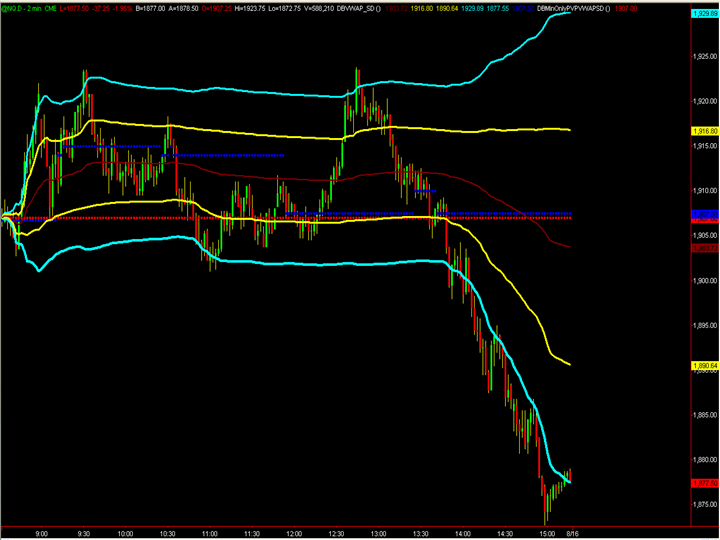 As long as the statistics are valid, any violations of the VWAP or SD should occur in a random fashion. Use of the Shaprio Effect should help find those. Haha, the cliffs of moher image. 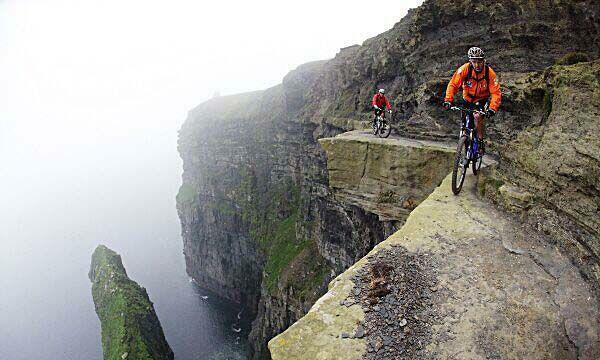 Those guys look like they are out in full force to try to win a darwin award. keep it coming. Great examples for the Shaprio Effect. I didn't get your text explanation but those videos made total sense. 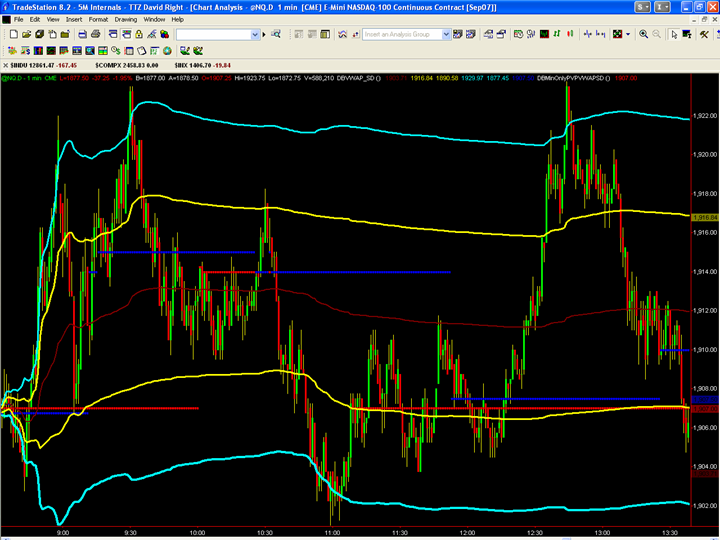 Seems like a great way to have a little system to make sure to get in on a retrace. Just found this thread. Fascinating stuff - kudos to jperl for the clear and cogent lessons! I also assume that when prices do go your way, you immediately place a break-even stop when you're up 10-20 ticks? I know this system is difficult to back-test so I'm just curious to know what kind of stats you have accumulated using this method... I'm wondering if a 100 point stop gives the market enough room to revert back in the direction of the skew if I were unfortunate enough to get caught in a break-out... but at that point you wonder if the trade was good to begin with, very hard on the nerves I imagine... at that point discretion comes into play would you say? Great threads, keep em coming! When using Shapiro Effect trading with the skew, how often have you seen prices breakout against the skew and stop you out, and how much wiggle room should one allow the market to have before you bail? If you are afraid of using risk tolerance as a trading philosophy, then you need to have a nearby hard stop for your trade. If you entered short using the Shapiro Effect, then you entered below the low of a nearby up bar. Set the stop 1 tick above the high of that bar. Simlarly for longs. If that's your risk tolerance, then by definition you are comfortable with it. If you are not comfortable with it, then you need to redefine a different risk tolerance. I also assume that when prices do go your way, you immediately place a break-even stop when you're up 10-20 ticks? The number of ticks up where I would set a break-even stop depends on what I'm trading. For me a break-even stop is discretionary, it depends how the trade is going. I hope you are not thinking that I am giving you a method to trade, rather than a tool to use for understanding price action. The "method" will depend on your trading style. Exact entry, stoploss points, and profit targets will depend on your trading style which only you can develop for yourself. That being said, the stats for trading wil be based on your trading style. If you know where and how I trade, then you know my stats. But my stats won't be anyone else's stats using the same tools. I'm wondering if a 100 point stop gives the market enough room to revert back in the direction of the skew if I were unfortunate enough to get caught in a break-out... but at that point you wonder if the trade was good to begin with, very hard on the nerves I imagine... at that point discretion comes into play would you say? If you have to wonder whether the trade is any good, then you probably shouldn't have been in the trade in the first place. Before you enter a trade you must have all your ducks set up so you know exactly what you will do when the market decides to move against you. Good reply. I should have probably put more thought in my post. I'm still very new to this game and I have so many questions... . I am just really impressed with this information you have forwarded to us and I really hope someday I can include it in a method of my own. So many ways to trade the market it's really overwealming at first, I admire you veteran traders who stuck with it for so long and became successful. Props! 1 valid short on the russel today. Yes that would have been a good basic short trade O66. "VWAP seems to slow" is an interesting way to put it. What you are observing is the slope of the VWAP is going to zero with price action sitting in the PVP zone as described in this thread. A difficult place to initiate a trade as you are learning. There were several attempts at a break out to the downside from this zone starting at 12:42 (East Coast time) with the final break out occurring at 13.54. Here is where risk tolerance plays a crucial role. The first false breakout at 12:42 was below the SD @ 774.92. Could you have tolerated the market moving back to the VWAP at 778.76? which it did at 13:36. That's $400/contract. If the answer is yes and you stuck with it, you would have had a good short trade of at least 4 points and more to the downside. If the answer is no, then you would have been stopped out. I really like the concept of risk tolerance over using stops and quickly moving your stop to breakeven because of constant bleeding of account and getting stopped quickly before catching a good move. That is what attracted me so much to this method. I like the concept of scaling in at 1st SD and VWAP with stop at PVP or opposite 1 SD. Most of the time the market may have a general drift bias but the way it moves is back and forth, back and forth rotating between levels with a slight bias. Trying the trade the conventional way for me has been an exercise in futility and constant stopouts and breakeven trades with an occasional runner that you hope compensates you for the stopouts. It seems that the breakout trade goes against the risk tolerance, give the market room situation that you described earlier in your posts. It seems like you would have a lot of breakeven or stopout trades that would not be made up by taking the trade off at the next standard deviation. Anyway, with the introduction of the shapiro effect, if you had a skew to the downside and the market retraced up to the lower 1SD and gave a valid shapiro signal and you went short, would you put a stop at the high bar or if it comes all the way up to the VWAP scale in short again on another shapiro signal if you get it? It seems that if I start using these close stops again...I am in the same boat I was in before? I was under the impression that was what you were cautioning against using these close stops all the time (which I can definitely resonate with). I understand some may be more comfortable with tight stops but were you just showing others how they could use the tools with tight stops, but you still use the risk tolerance scale in method? Just want to make sure I understand correctly. Also, Howard said that as far as Ensign computing the volume distribution bars they are taking the price if it trades over three price levels and the volume is 3000, then the volume is 1000 at each price level. When I compare the PVP based off tick by tick to the 2 minute coded PVP on my charts there are times when they are considerably different. Yes, this is the problem with breakout trades against the skew in general. There can be several pseudo breakouts that fail. This is why they are so difficult to execute properly and why I don't like them. Anyway, with the introduction of the shapiro effect, if you had a skew to the downside and the market retraced up to the lower 1SD and gave a valid shapiro signal and you went short, would you put a stop at the high bar or if it comes all the way up to the VWAP scale in short again on another shapiro signal if you get it? 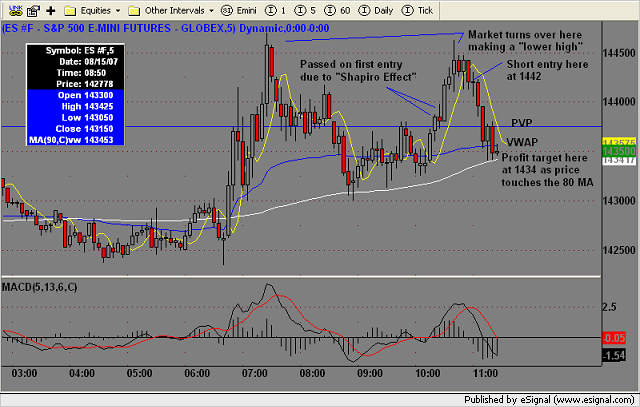 If you are using risk tolerance, then yes, wait for the market to retrace to the VWAP and scale-in. If risk-tolerance is not your cup of tea, then you have to set a hard stop and it might as well be the high of the entry bar. It seems that if I start using these close stops again...I am in the same boat I was in before? I was under the impression that was what you were cautioning against using these close stops all the time (which I can definitely resonate with). Correct, I use risk tolerance with scale-in rather than tight stops for trades in the skew direction. For break-out trades against the skew, I will use a break even stop quickly, but if I can't do that, I will put a stop just below the VWAP. There really is no good scale-in point. That's interesting. How many ticks different are they? I thought this might be of interest. I have modified the setup a bit because I don't have all the indicators in place just yet. I use another chart showing time at price to tell me where the PVP is, and I have a volume weighted MA on my chart to estimate the VWAP. As can be seen this trade worked well, betting against the breakout. I should have stay in longer. As can be seen by this next chart, there is good reason (in my opinion) to use the "Shapiro Effect" rule for exits as well as entries. 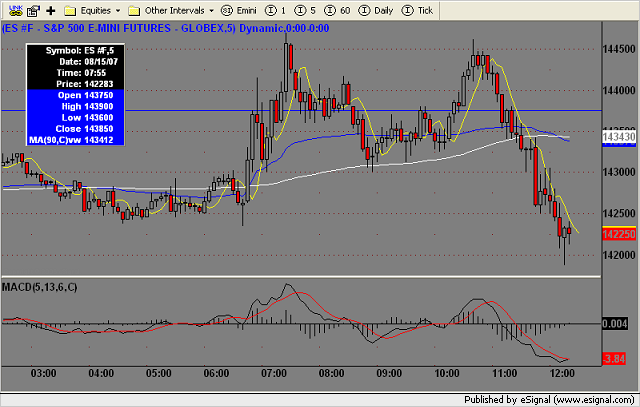 Staying in this trade, either by scaling out, or simply holding would have resulted in a significant additional profit. Given that volatility has expanded so much this last month I will have to remember to scale out rather than exit in one piece. Thanks for your comments jperl. vwap was above pvp and i thought only longs were allowed in this scenario. is waiting for breaking down and retracing back (with shapiro) to sd a good way to avoid the false breakouts? I have the two eld's complete that will plot the tick by tick pvp on a minute based chart using ADE (Kudos to BAMBOO..Thanks in Tradestation and it is integrated so that you can see the VWAP and SD bands with the tick by tick PVP all on one chart. I do not want to post indicators here because I just don't want to be that formal and try and support a bunch of questions, etc. It works fine for stock indexes but for some reason different computers with different versions have to make slight modifications to a section of the code dealing with the minmove keyword. The code is set up for price increments less than a point. It would be easy to modify the code for other prices...but I am not trying to create professional level software for all situations right now. Just creating accurate code for following JPERL's threads currently in ES and NQ. So I don't feel comfortable posting the code for all futures...stocks etc. But if you are a tradestation user and you would like the code...email me here and I will send it to you. The code is keeping track of volume at every price on a tick by tick basis so would not be hard to plot trendlines as a histogram so eventually I will go there but I don't know how soon I will get to it. Probably not, but I haven't investigated this in any detail. When the real breakout occurs, there won't be any retrace. It just goes. I am enjoying the threads, thank you for sharing your ideas. PVP on a tick by tick and the PVP on a 2 minute chart with equalized volume over the bar tomorrow while I am watching it. I wrote the code for the 2 minute and compared it to the tick by tick PVP and I want to say it was off by at least 2 points or more (ES). It happens when there is a higher peak above then another peak several points below it and because of the way the volume is portioned out the PVP can stay higher/lower for a while even though the PVP on a tick by tick has already moved. Then in general it will be a couple ticks off also. I will wait for a concrete example and take a screenshot of both, one calculated the ensign method on a 2 minute and one calculated tick by tick and post it if I get an example tomorrow for you. I have no problems if someone else who has the pvp, vwap and sd bands wants to take the code and post it themselves here and offer support for it. I had some help from blowfish and I would just like the code be free for anyone who wants it. If anyone wants to add to it spruce it up feel free. It is completely open code. OK thanks dbntina. If you get a comparison, I would like to send something to Howard in this regard. In your last video series (I think it was the first of the 3) on BO trades I noticed that Ensign updates the histogram at the close of the bar. It seems to evenly distribute the volume across all price levels of the bar. Here is yesterdays NQ chart. The blue dotted line is the tick by tick pvp. The red dotted line is the averaging bar volume over the price levels PVP. You can see the 2 minute is way off. You can see the 1 minute is a little closer. It can be way off at times when you have peaks that are close at two different levels. Here are the two charts.